Click here for a closeup shot. 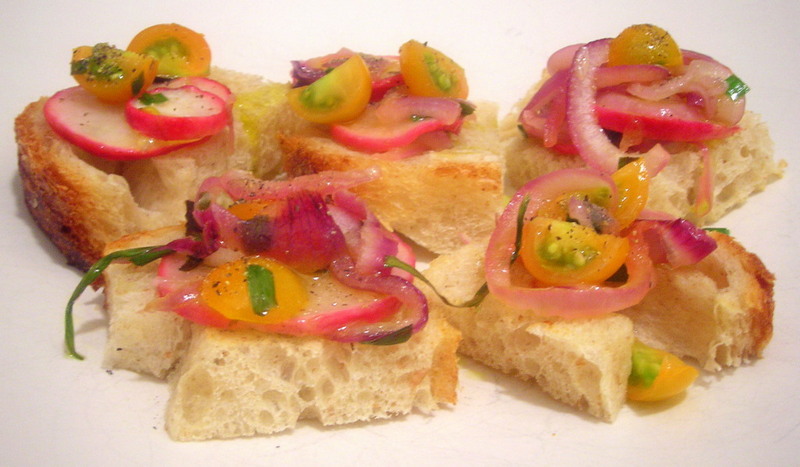 Radishes and red cippolini onions were roasted in a 350 F oven for 30 minutes, then combined with halved Sungold cherry tomatoes and garlic chives, and spooned atop slices of toasted sourdough bread. If this were true bruschetta, I’d have used Italian bread or perhaps a baguette, but I didn’t have that luxury this time around. Main entrée was a plain French omelette and salad greens with a white wine viniagrette. 11 Aug	This entry was published on August 11, 2009 at 3:38 am. It’s filed under food, general, Italian food, summer, vegetarian and tagged cooking, cooking demo, dinner, eggs, Julia Child, Media, omelette, quick and easy, radish, recession, slow food, tomato, vegetarian. Bookmark the permalink. Follow any comments here with the RSS feed for this post. Have you seen the movie “Julia” yet? I didn’t even know it was coming out but a friend recommended it to me yesterday. As for the radishes, I’ve taken to grilling them whole in my veggie grill basket…..after marinating them, of course. Delicious! May I humbly suggest you try it if you haven’t already. I haven’t seen the movie but I think I’ll pass on this one (or wait until it comes out on DVD). As for grilled radishes, I live in an apartment. Ventilation is an issue so that’s out unfortunately. WAHOO! (NO, we too are waiting for the DVD)…………. but LOVED the omelet show! RODGER and I just bought the entire French Chef DVD collection………and DO plan on learning, then cooking, many new things. I have NEVER been an omelet expert at all, so this was mighty fine to learn………considering we both love eggs.